We provide the designer, create your own design! For customers that have a specific design concept in mind or simply want to design something that's not in our stock template graphic gallery, our very talented Graphics Lab design team can create one-of-a-kind designs from your ideas and turn your table into a true masterpiece! BBO's Custom Graphics Lab Full Custom projects all start from a blank canvas and are developed with the customer's ideas and instructions. All Full Custom Graphic Designs are printed on our proprietary Dynamic Gaming Suede, which is a medium-heavy weight, waterproof, casino grade fabric with a very short nap for durable but plush casino like action. All Full Custom Graphic projects include sizing and color matching to your table. 1. 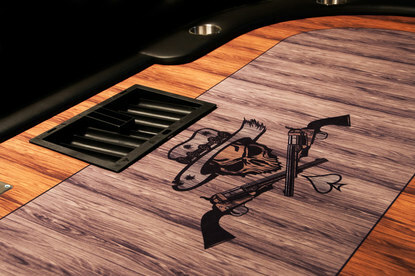 Fill out your poker table specifications in the buy section above including dimensions and notes regarding your project. 2. Proceed to checkout and complete your purchase. 3. Within 24 hours of the purchase, our Custom Graphics Lab designer will contact you via phone for your initial project overview, at which time you can discuss your project ideas with your designer. This is the time to clearly and completely articulate your project and give any examples and assets to your designer. 4. The designer will submit the first draft of your graphic within 7 business days. 5. You will have unlimited revisions until you approve and sign off on your graphic design project, at which time it will be sent to printing. We will ship your graphic out to you as soon as your graphic is printed and checked to be perfect. Please note that there may be additional charges in certain, design heavy projects. The two scenarios in which there may be additional charges are below, but of course, we will authorize them with you first. Tracing is required to convert a hand-drawn artwork from a drawing or paper to digital. If your design requires tracing, an additional $50 charge will apply. For example, if you want to turn a low-resolution cell phone picture into a poker felt, this applies. Some graphic designs that are being created from an idea or description may require the services of an illustrator. If you don't have a visual representation of what you would like and we are working off of descriptions, an illustrator may be required to assess your project and bring it to life and additional charges will apply. BBO's Full Custom Graphic Design is the easiest way to create your dream table, and you will be in control each and every step of the way.